Walk to the Kawishiwi Waterfalls! What brings you to Ely, MN? 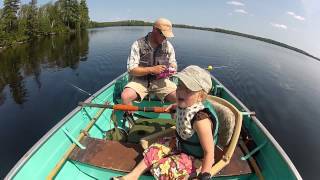 Wilderness kayaking, world class fishing, family and friends summer vacation, a couples quiet getaway, Boundary Waters Canoe Area Wilderness (BWCAW), mountain biking. Whatever it is, Cabin 10 at the Deer Ridge Resort is just what the doctor ordered - a luxury, lakeview log cabin! Cabin time here includes a large sun deck with picnic table, lawn chairs, charcoal grill, and a view of the lake. Inside, your cooking and kitchen needs are met with cookware, bakeware, utensils, coffee maker and microwave. We take great pride in our 9 beautiful, modern, clean, spacious and comfortable log cabins. If you need more rooms, rent neighboring cabins. Sleeping arrangement: downstairs bedroom, 1 full bed. Upstairs loft bedroom, one king bed. Bathroom downstairs. Cabin 10 is located at the edge of the resort so it’s a bit more private (right next to the interpretive nature trail too). Garden Lake is part of the White Iron Chain of lakes - 6,000 acres of world class fishing - let that sink in. Garden Lake is famous for smallmouth bass and crappie; trophy northern pike can be found in 1,328 acre Farm Lake. Resort amenities like fish cleaning facility, Sauna, Ice, Store/office, Gas should cover your camping needs for the week. Up for some wilderness hiking? You don’t have to wander far. Cabin 10 on Deer Ridge Resort is on 35 ACRES OF PRISTINE WOODLANDS and we have an interpretive nature trail. The Ely area provides many unique opportunities: Discover a boreal forest formed by glaciers 10,000 years ago. Locals have their favorites - Bass Lake Trail, the Angleworm Trail, Trezona Trail, Hidden Valley. If your fishing trip includes a guide or motor permits (a few lakes are open in the BWCA to motorized water crafts) - please contact us in advance as permits are very limited and local fishing guides book up as quick as our cabins. We specialize in planning fishing adventures so ask us for a lake maps marked up with hot spots. Things to remember: Kitchen and bath towels. Check in time 3:30 p.m., check out time 10 a.m. Reservation requires $300 minimum deposit. Guests pay in full during check in. Add Minnesota state tax and local lodging tax. $110 weekly and $20 nightly for additional guests. Boat rentals start at $75/day or $325/wk. Dogs are welcome. We are a small family run resort and we like it that way because we can give our guests a personal touch. The great outdoors of Ely is calling - do you hear it? Loons, wildlife, lapping waves and beautiful sunset over Garden Lake. Like this resort? Send us an inquiry today and we can help you plan one of the greatest adventures you’ll ever go on.